The browntail moth is an invasive species found only on the coast of Maine and Cape Cod. This moth is an insect of both forest and human health concern. 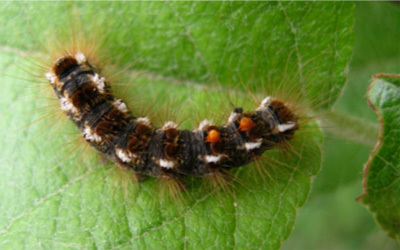 The browntail moth caterpillar has tiny poisonous hairs that cause dermatitis similar to poison ivy on sensitive individuals. People may develop dermatitis from direct contact with the caterpillar or indirectly from contact with airborne hairs. The hairs become airborne from either being dislodged from the living or dead caterpillar or they come from cast skins with the caterpillar molts. Most people affected by the hairs develop a localized rash that will last for a few hours up to several days but on some sensitive individuals the rash can be severe and last for several weeks. The rash results from both a chemical reaction to a toxin in the hairs and a physical irritation as the barbed hairs become embedded in the skin. Respiratory distress from inhaling the hairs can be serious. Close-up view of Browntail moth caterpillar on a leaf. Close-up view of Browntail moth caterpillars on a tree. 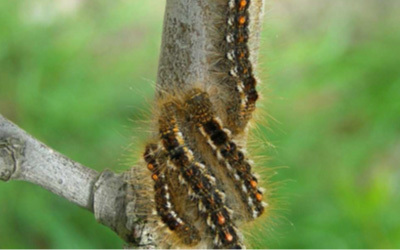 Pursuant to Maine Statute Title 22, §1444 the Chief Operating Officer (COO) of Maine CDC can declare an infestation of browntail moths (BTM) as a public health nuisance*. The declaration may be made on the COO's initiative or upon petition by municipal officers. Below is the process for declarations made upon petition by a municipality. 1. The municipality must complete the BTM Public Health Nuisance Request Form (*Word) on town letterhead. 2. A letter from the Maine Forest Service, documenting the infestation in the town, shall accompany the Request for a BTM Public Health Nuisance Request form. 3. The municipality must have a letter from their local health officer supporting the request. 1. A copy will be made of the request upon receipt by Division of Disease Control staff. 2. One copy will be submitted to the COO for review and signature; the second copy will be provided to the vectorborne epidemiologist, who will notify the Maine Forest Service (State Entomologist) of the request. 3. If approved, petitions submitted from January 1 to August 31 will expire on December 31 of the current year. Petitions submitted from September 1 to December 31 will expire on December 31 of the following year. 4. The form, indicating approval or denial and signed by the Maine CDC COO will be returned to the municipality via US mail. * A public health nuisance is defined as any activity or failure to act that adversely affects public health. Examples include improperly stored solid waste such as rotting garbage or dead animals, or insect or rodent infestations.